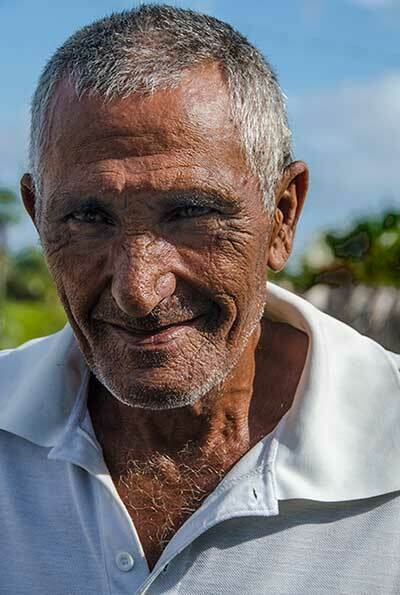 It was the last day of a six-day fishing trip in early November to Cayo Paredón Grande, a little-known barrier island off Cuba’s northeast coast, situated about 40 kilometers southeast of the resort island of Cayo Coco. After a bumpy, 40-minute ride from our Cayo Coco hotel in a tiny Chinese-made SUV, it was about 9 in the morning when George Anderson and John Connolly and I arrived at the isolated marina, carved out of the mangroves on the west side of the island. Fishing had not been good over the past five days. We’d experienced high water, overcast skies and very strong winds. Day Four had been a complete bust, as storms chased us off the water. Still, I wasn’t discouraged. 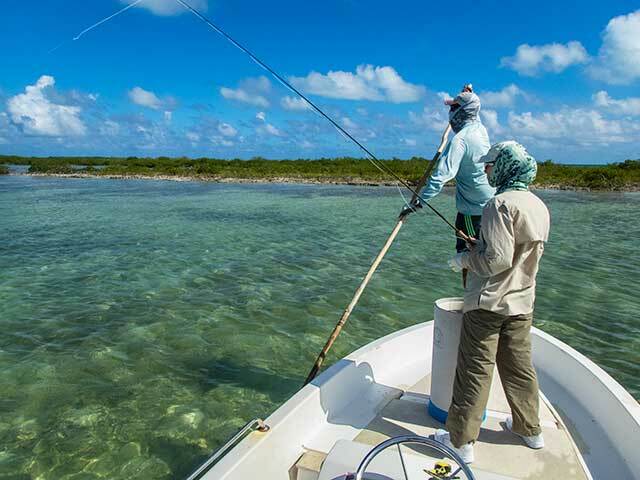 Great fishing spots don’t always yield great results, and even on this first visit, I could tell Cayo Paredón was a great spot, with crystal-clear water, hard-bottomed flats, unpressured fish and easy access between ocean and flats. Macillio is one of the marina empoyees who helps load boats before the day’s fishing and clean equipment afterwards. The sky was clear, the wind brisk but manageable when Duniesky and I started out in his skiff. I was fishing solo, since my fishing partner, my wife, Sue, had decided to take the day off and relax at the Cayo Coco resort where we were staying. Duniesky’s skiff was unlike any I’d ever fished out of. In fact, it wasn’t a skiff at all but a runabout, 17 feet long, high-sided and broad-beamed with a semi-vee hull that would pole no shallower than 12 to 14 inches and was guaranteed to provide plenty of hull slap on the flats. Its 11-year-old, 60-horse Yamaha Enduro two-stroke pushed it along at a pretty good clip, thanks in part to some custom work Duniesky had done on the motor (more about that later). We ran a short distance to a shallow flat. The tide was low and incoming, wind and sun were behind us, so, for the first time in six days, we had good conditions to sight-fish for bones. I stood on the casting deck, eight-weight in hand. Duniesky grabbed his push pole and positioned himself in the only spot in the boat where he could see the fish and manage his bulky boat in the wind — right in front of me at the peak of the bow. When he spotted a fish, he’d call out the location, then crouch down. I’d cast over his head, either forehand or backhand, depending on which side of the boat the fish appeared. When I first saw this arrangement on Day One with one of the other guides, Alex, I nearly freaked out, fearing I’d hook the guide on either forward or back cast. Now, five days later, I was accustomed to it, though it still added a degree of difficulty to the whole endeavor. Guide Alex (Lisandro Rivero Rodgrguez) poles his runabout for Sue Panther in Cayo Paredon, Cuba. This unusual poling position is necessary becasuse of the height and bulk of the boat. When he spots a fish, he’ll crouch down and let the angler cast over him. We poled about 10 minutes, with Duniesky chattering about the fishing and pointing out small bones scurrying by but not suggesting I cast to them. That was fine with me since I was having trouble spotting them. There was no trouble, however, spotting the next fish he called out. It was a massive bonefish, long and green-backed, in the 12- to 15-pound range, slowly cruising the shoreline on our right in only inches of water. Duniesky knelt down as I shot a backhand cast in the fish’s direction. The fly landed short, but the fish turned, surveying it briefly, but declined the invitation to dine and slowly resumed his journey. Two more casts couldn’t convince him otherwise. After Duniesky and I regained our composure and gave our hearts a chance to settle down into a more normal rate, we resumed poling the flat. Over the next hour or so, we spotted eight fish in the 12-pound range. I had shots at four of them. In two instances, fish followed the fly right up to the boat before turning slowly away, not really spooked but wary. Duniesky crouched down on the casting deck as I fired off Hail Mary casts at their departing backs from the kneeling position. One of the fish paused to take another look at the fly but eventually swam away for good. Finally, we found a taker. A 12-pound bonefish charged the fly, clearly ready to eat, but at the last instant, a five-pounder darted in front of him and stole his lunch! That was the last oversized fish I had a chance at, but by the end of the day, I’d caught 15 bonefish with the largest around six pounds (just a tad bigger than the lunch thief). I also had one shot at permit. That was a reasonably good day of catching, even though it was disappointing not to connect with any of the giants of the morning. Regardless, it was a wonderful day for seeing the potential of the fishery at Cayo Paredón. It reinforced what Sue and I had experienced earlier in the week fishing with guide Alex under far less favorable conditions. A beautiful permit flat in Cayo Paredon, Cuba. The wind was strong out of the east, the tide already high and incoming on the first day of our trip when Sue and I fished with Alex (whose given name is Lisandro Rivero Rodriguez) in a boat almost identical to Duniesky’s, another high-sided, broad-beamed runabout that had to be poled from the bow. Despite the unfavorable conditions, Alex put us on fish right away. We caught bonefish up to about four pounds (and failed to connect with larger fish). I had three shots at permit; two showed interest but turned away at the last minute. The next day was a virtual repeat of the first, with one added bonus. Alex took us to a spot where he could stake out just upwind of a shallow trough that bonefish were using as a path to the skinniest part of the flat. He put Sue in the bow and let her pick off a few of them as they cruised by. We did that again a couple days later, and she caught her best fish of the trip, a pair of four-plus-pounders. On our third day of fishing with Alex, we tried wade fishing on a beautiful hard-bottomed flat on the low incoming tide. The potential was there, but the wind kicked up even stronger, so we abandoned the effort and went back to the boat. The day before, when the wind wasn’t quite so strong, John Connolly caught the best bonefish of the week, a solid eight-pounder, on the same flat. 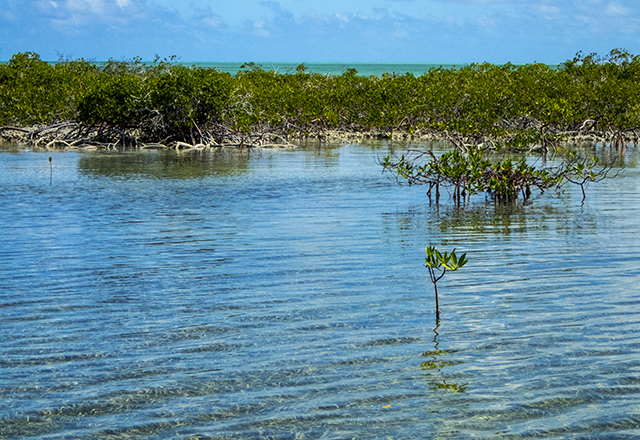 Under better conditions, the flats at Cayo Paredón are ideal for wading, and that’s the preferred method at lower tide stages. Smaller permit show on the same flats as bonefish, sometimes together with the bones. The larger fish — in the 20- to 30-pound range — are found on deeper flats which are also great tarpon spots in the spring and summer. Tarpon season runs from March through August. Unlike some other Cuban locations, permit seldom follow rays on to the flats. Instead, they swim in directly from the ocean, usually as singles or in pairs. There was one instance, however, when we spooked a school of at least a dozen large permit as we were motoring up on a flat. I had shots at permit every day except the day we were forced off the water by rainstorms. The fish ranged in size from 10 to 25 pounds. They behaved like permit everywhere, sometimes ignoring the fly altogether, other times showing interest but eventually turning up their noses at it. One shot stands out in my mind — the fish charged the fly but either missed it or spooked at the last instant. No one fishing out of the marina during our week caught permit. On a previous trip with better conditions, George Anderson had excellent luck, catching three, including two in one day. Guides prepare for the day’s fishing at Cayo Paredon, Cuba. The uniformed man on the left is a Cuban Coast Guardsman. Compared to some of the other locales I’ve fished in Cuba — Jardines de la Reina, Cayo Largo, the islands between Isla de la Juventud and Cayo Largo — the total area of the Cayo Paredón fishery is very small, with roughly 40 kilometers of shoreline, only 15 to 20 of which are in general use every day. By way of comparison, the Jardines de la Reina off the southern coast extend for 150 kilometers. As is typical in Cuban fishing venues, one company has exclusive rights to the area. In this instance, Marlin Náuticos y Marinas is the permit holder, and employs all the guides. 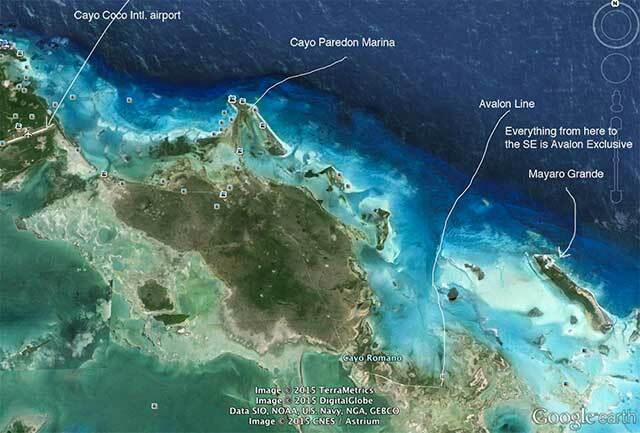 The Marlin area extends from a point close to Cayo Coco eastward to an imaginary line that constitutes the boundary with the exclusive operation at Cayo Cruz operated by the Italian company Avalon. Both the Cayo Paredón and Cayo Cruz fisheries are included in marine protective areas that roughly correspond to our national parks. No commercial fishing other than lobstering and crabbing is allowed. Fisheries are catch and release for prime species, and access is limited to boats managed by the permit holder. That means very low fishing pressure. During our week, the four of us used the services of two guides every day. That’s two boats on the water. Other anglers used no more than two additional boats, so that was four boats, total. Only six or seven guides operate out of the marina. During the fishing day, it was rare to see another boat, except at a distance. Despite its small size, the Cayo Paredón area contains an incredible variety of habitats. There are shallow, hard-bottomed flats, perfect for wading under conditions less severe than we experienced. There are deeper flats and channels for permit and seasonal tarpon. 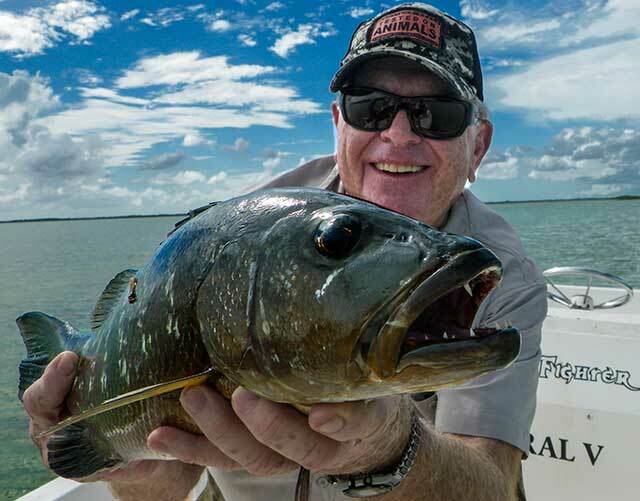 Mangrove pockets and potholes on the flats are home to very large cubera and mangrove snapper. Some anglers spend their whole trip hunting the cuberas on spin gear with heavy braided line and large topwater plugs. There’s an extensive backcountry, which the bonefish love and shallow-water skiffs can access. Hidden deep in the backcountry is a spot nicknamed Ciudad Palometa (Permit City) where smaller permit and large bones congregate in very shallow water. Cayo Paredón and Cayo Cruz aren’t the only marine protective areas areas in Cuba. They extend all around the country. The first place so designated was Jardines de la Reina on the southern coast, which came under protection in the ’90s and is managed by Avalon. Later, other areas were added: the islands between Isla de la Juventud and Cayo Largo, including Cayo Largo itself; the area around the Bay of Pigs, including Las Salinas and the Zapata Swamp; areas off the western tip of Cuba in Pinar del Rio and the easternmost point of the island near Santiago. Regulations vary from spot to spot, but in all cases, the intent is to protect coral reefs and marine life, manage the fisheries and preserve outstanding geographical features. Together, the marine protective areas constitute approximately 25 percent of the Cuban insular shelf. The result is healthy coral reefs and an incredible diversity of marine wildlife. What the marine protective areas mean to anglers is that habitat is protected, net fishing is banned, and access is limited (though not as much now as it was when the protective areas were first created). George Anderson caught this cubera snapper on a topwater plug at Cayo Paredon, Cuba. The ability and attitude of the guides has a great deal to do with the quality of the Cayo Paredón fishery. All are experienced, with anywhere from seven to 12 years guiding. Alex and Duniesky are on the water almost every day and approach the fishing with a contagious enthusiasm. They also possess a highly protective attitude toward the resource. For example, guides don’t encourage photographing every fish. Most bonefish are released in the water without being held at all. No tarpon of any size are taken out of the water. If you want a trophy photograph, you get in the water with the fish, lift it up, holding it horizontally, just for a moment, thereby minimizing air exposure and stress for the fish. Alex made an exception with two of Sue’s bonefish, bringing them into the boat, but, even then, the fish were out of water for a very brief time. As good as the guides are, the facilities are bare bones, to say the least. The marina itself is a motley collection of buildings in a small clearing in the mangrove. There are a couple of sheds to house gear and a shelter anglers can use to assemble gear and put on wading boots. Amenities are non-existent … not even a restroom. When I asked one of the non-guide employees who helps load the boats if there was a baño, he waved his hand at the wooded area outside the fence around the marina, “This is Cuba,” he laughed. 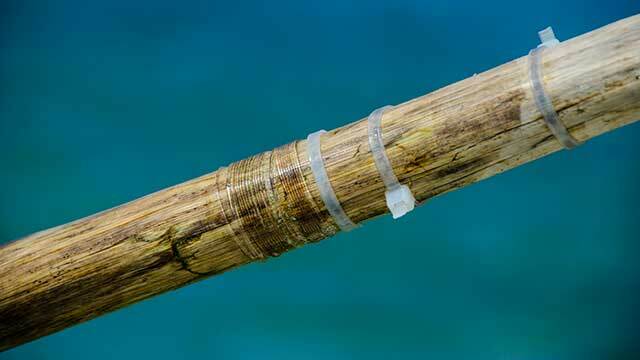 Guide Alex (Lisandro Rivero Rodgrguez) fashioned his pushpole from this mangrove branch reinforced by zip-ties and fluorocarbon wrappings. Cayo Paredon, Cuba. Still, the minimal nature of the facility is more than offset by the graciousness of the guides and other staff. Leading down to the water from the marina is a rickety dock where the boats are moored. I’ve already mentioned the unconventional skiffs employed by Alex and Duniesky. They actually prefer the runabouts since those boats enable them to troll offshore for wahoo and tuna as well as fish the flats using their unique poling technique. Other guides rely on more conventional flats boats — Mitzi skiffs and a no-name craft, all outfitted with poling platforms and 40-horse Yamahas. Push poles range from what appear to be very heavy manufactured fiberglass poles to Alex’s custom-made pole cultivated from a mangrove branch and reinforced with plastic zip-ties and heavy-duty fluorocarbon wrappings. On the day I fished with Duniesky, his push pole was a section of fiberglass attached with lashings to a section of mangrove. The 60-horse Yamaha on Duniesky’s skiff was three years old when he got it. After running it more than 300 days a year for eight years, he decided it needed to be rebuilt. There were no Yamaha parts available, so he salvaged pistons and rings from an old Lada automobile, a Eastern Bloc imitation of a Fiat introduced in Cuba during the years Cuba and the former Soviet Union had a close relationship. I have no conception how he made those parts work together, but he did, and the result seems to run fine. He claimed his motor is closer to 90-horse after the rebuild, and, I have to admit, it did seem more responsive, with better get-up-and-go, than Alex’s unmodified 60-horse. 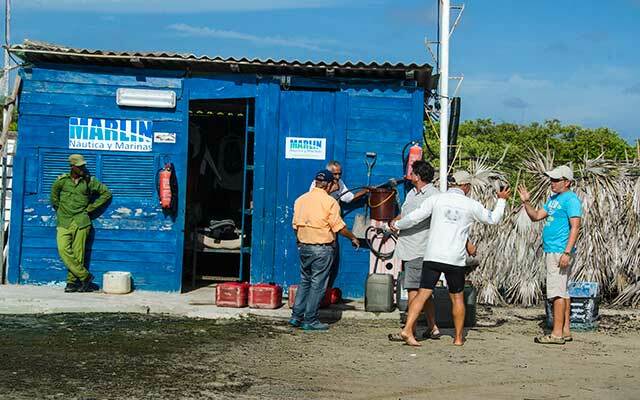 The make-do facilities and equipment at Cayo Paredón are far different from other Cuban fishing operations, particularly those managed by Avalon. Avalon sites in Jardines de la Reina, Cayo Largo, Isla de la Juventud and Cayo Cruz employ modern flats skiffs, either Dolphin Super Skiffs, or, in Cayo Cruz, Mitzis, with relatively new motors and high-tech push poles. That wasn’t always the case. My first trip to Cuba was with Avalon at Jardines de la Reina in 1998. At that time, their flats skiffs were primitive wooden craft that had to be continually bailed, but the fishing was great. In the years since, the equipment has gotten much better, but fishing pressure has increased, though the fishing itself is still very good and occasionally spectacular. In a sense, the fishery at Cayo Paredón is somewhat like the Jardines were 15 years ago — you have to put up with bare-bones equipment and minimal facilities, but you get to fish an area where the fish are unpressured and, under better weather conditions than we experienced, eager to eat flies. 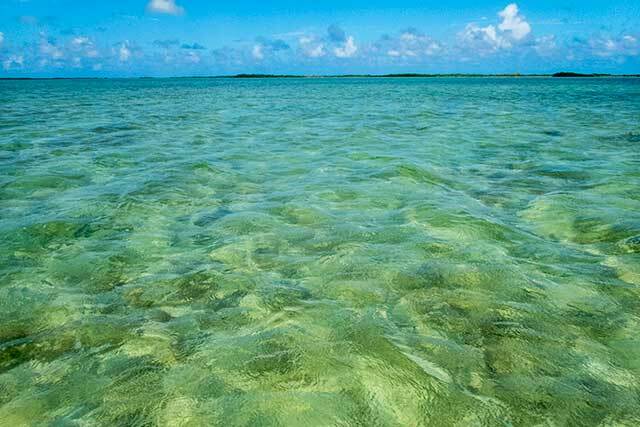 Shallow flats at Cayo Paredon, Cuba. On the other side of the barrier island is the Atlantic. As great as the fishing is at Cayo Paredón and other Cuban venues, there’s bad new down the road. Tourism is the engine that drives the Cuban economy. It’s the country’s only real source of foreign exchange, and the government is doing everything it can to promote it. According to Granma, the official government publication, the country now has 65,000 hotel rooms. By 2020, that number is expected to increase to 85,000. More tourists mean more impact on facilities and more demand for water-based recreation. Avalon is already increasing the number of anglers who have access to its sites. For example, when I first fished Jardines de la Reina in 1998, all anglers and divers stayed on a single moored houseboat, La Tortuga. Only eight boats fished the flats at any one time. Now, in addition to La Tortuga, there are four other motherships plying the Jardines. Fishing pressure has increased exponentially. Instead of eight skiffs, there are now as many as 20 fishing the area. That’s true in other locations, too, though not yet at Cayo Paredón. The future concern at Cayo Coco and Cayo Paredón is the plan to build additional hotels along the beaches and extend roads through the wetlands. When we traveled the 40 kilometers from the Cayo Coco resort area to Cayo Paredón, part of the journey was on a road built on fill dirt laid across the wetlands. That road, which is very rough right now, will be improved and expanded. Another road is in the process of being constructed between Cayo Coco and Cayo Cruz. That, too, will be based on fill dirt laid across an even more extensive stretch of wetlands. As anyone who lives in South Florida can attest, roads across wetlands are a bad idea. They act essentially as dams that block the natural water flow between estuaries and the sea. Both the Tamiami Trail, which was constructed in the late 1920s and the later Alligator Alley (I-75) impede water flow into Everglades National Park from wetlands to the north, and that has an adverse effect on water flow out of the Park into Florida Bay. At some point, the fisheries at Cayo Paredón and Cayo Cruz will experience the negative impact of the roads now in progress. Of course, the elephant, not quite in the room yet, is the American tourist. Once Cuba is open without restriction to American tourists, the number of visitors — more importantly, the number of anglers — will increase substantially. The lesson, I suppose, is to fish Cuba now. 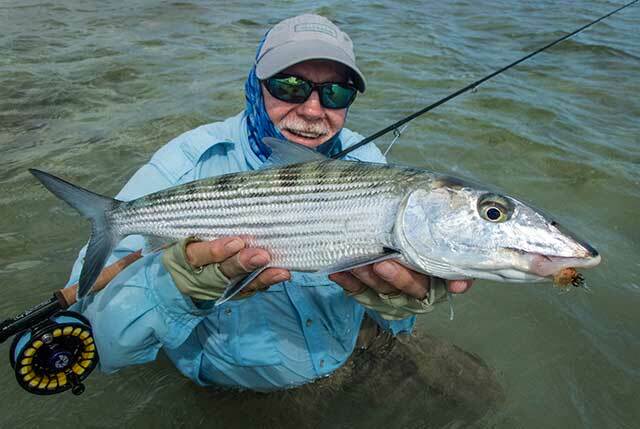 Bill Blanton shows off a 6-pound bonefish caught on the flats of Cayo Paredon, Cuba. Since restrictions for Americans wishing to travel to Cuba were eased in January, 2015, there are more opportunities for Cuba travel, and 12 categories of legal travel have been defined. Adventure travel agencies and fly shops are offering package deals to the better-known venues like Jardines de la Reina and Cayo Largo. Our trip was hosted by George Anderson’s Yellowstone Angler in Livingston, Montana (www.yellowstoneangler.com). To my knowledge, there are no other deals by U.S. fly shops or travel agencies for Cayo Coco and Cayo Paredón. In fact, very few Americans have visited there in the past. One of the waiters in our Cayo Coco resort told Sue and me we were the third and fourth Americans he’d served in the seven years he’d worked there. You have to create your own itinerary. An agent licensed to offer travel services between the U.S. and Cuba can help with the details (see below). We stayed at the all-inclusive Meliá Cayo Coco. The hotel is very luxurious, with many activities for non-fishing spouses. There’s a beautiful pool, excellent beach access, snorkeling, dancing, a nightly floor show featuring talented young performers — you name it. The resort has several a la carte restaurants in addition to the very fine buffet restaurant where most meals are served. There are some DIY flats near the hotel, and we met British and Canadian anglers who split their fishing time between those flats and guided trips out of Cayo Paredón. On one of the days we were battling the wind at Cayo Paredón, a Canadian caught 10 bonefish up to six pounds wading one of the Cayo Coco flats. Traveling to Cuba from select U.S. cities is getting easier every day. At this writing, there are direct flights to Havana from Miami, Tampa, Orlando, New York, Los Angeles and Washington, D.C. There are also less frequent direct flights to a few other Cuban cities: Camaquey, Hoguin, Cienfuegos and Santa Clara. If you can quality for one of the 12 current travel licenses for U.S. citizens, you won’t have any trouble getting to the island. Most American travelers do like we did and fly to Havana first, spend a few days exploring the city, then branch out to other areas of the island. That can be very appealing since Havana is a fascinating city with many attractions. We stayed in Old Havana in the Iberostar Parque Central Hotel. We had two and a half days and two nights there, which was not really enough time to experience the city and still be rested for the long trip from Havana to Cayo Coco, 527 kilometers, or about six hours by car. Air travel is faster, of course, and there are direct flights from Havana to Cayo Coco. The problem is, domestic air travel in Cuba is very unreliable, often frustrating and frequently exhausting. For example, on our flight from Havana to Cayo Coco, we had to catch a 3 a.m. bus from the hotel to the domestic airport for a 7 a.m. flight. On our return from Cayo Coco to Havana, we had reservations either on an 11 a.m. flight or a 10 p.m. flight. The airline couldn’t tell us which until the afternoon before. Turned out it was the 10 p.m. flight, so Sue and I decided to hire a taxi to take us back to Havana. The six-hour trip turned out to be very enjoyable and let me get another look at some of the spots I’d seen on a similar drive back in 1998. Just like in 1998, the countryside is extremely rural, with cane fields, banana plantations and other crops dominating the scenery. You see a lot of horse-drawn or oxen-drawn carts, usually outfitted with automobile tires. In the small towns between Cayo Coco and Havana, there was a lot more activity than I saw in 1998. That was at the tail end of what Cubans call the Special Period, the economic downturn after the collapse of Cuba’s former trading partner, the Soviet Union, in 1991. Now, there are signs of an improved economy, including semi-private enterprises. We saw many paladores, which are privately owned restaurants operated under license from the government. We ate at one, which was immediately adjacent to the fenced-in yard where future dinners were still running around, either clucking or oinking. It was clearly a place for locals, as the menu was priced in the domestic peso that Cubans use rather than the convertible peso that is required in the tourist economy. Trucks were parked out front — always a good sign in rural areas — and we were served the best roast pork we ate anywhere in Cuba. Next time, I think we’ll rent a car so we can spend more time exploring the countryside. If you are just interested in the fishing in Cayo Paredón and don’t care about the attractions of Havana, a good plan would be to fly directly from the U.S. to Camaquey, then have only a two-hour drive to Cayo Coco. In most other destinations where guided fishing trips are offered, guides are independent operators who charge a daily fee. All of that fee goes to them. It covers their expenses and constitutes a portion of their profit. Anglers may or may not tip, depending on service and their own personal preference. The tip is extra income for the guide, a token of appreciation. That’s not the case in Cuba. The daily guide fee at Cayo Paredón is $240 paid in Cuban Convertible Pesos (CUC). NONE OF THAT MONEY GOES TO THE GUIDE. It all goes to the permit holder, Marlin, and the Cuban government. The guide receives a pittance of a monthly salary. His only real income of substance, his only real reward for hours of hard work poling anglers around in the hot sun is the tip. So tip always and tip generously. When we booked our trip, we built in a daily tip of $50 per guide. I gave more on top of that on days when the guide worked extra hard. I also tipped the two men, one old, one young, who carried our gear to the boats and washed the salt off our equipment at the end of the fishing day. What’s true of the guides is also true of all Cubans you encounter in service industries. I tipped the waiters at the restaurants, the drivers who transported us from place to place, the bellhops and every other person in the service industry I encountered who in any way contributed to my enjoyable stay in Cuba.